What might that be? 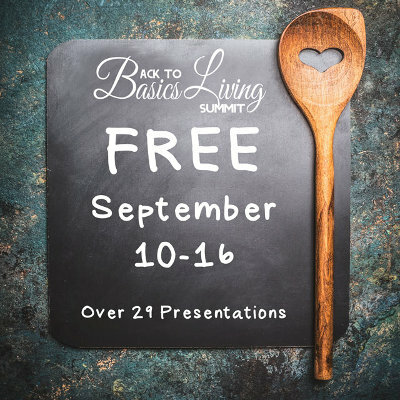 It's the Back To Basics Living Summit. This is an online webinar which will run September 10-16, 2017. It's being organized by the same folks who do the Back To Basics Living and Prepper eBook bundles. This new venue looks to be an excellent resource. You need to register, however, to reserve a spot and receive sign in details. Click here for more information and to sign up. If you can't make it during the scheduled video times, there is also options to purchase lifetime access to the webinar. Door Buster Discount: Aug. 27 - Sept 12 - $59.97 for lifetime online access, $99.97 for that plus the videos on flash drive. Early Bird Sale: Sept. 13 - 16 - $99.97 for lifetime access, $139.97 for online access plus flash drive. Regular Price: after Sept. 16 - $119.97 for lifetime access, $159.97 for lifetime access plus flash drive. You'll find those options by following the above link as well. But it's free if you can make the scheduled video times, which is my kind of webinar! Nancy, the class on Urban Gardening should be right up your alley! Rain, me too! LOL I'm interested in quite a bit of it though. I missed this last year but I am registered and ready to go this year!!!! My garage sale is the 9th so the timing couldn't have been better! I'll be mentioning this on my website also....thank you Leigh! Great! Send them my way for details or questions. I think it's a great opportunity for anyone interested in homesteading and simple living skills. How awesome!! Some of those topics are right up my alley - I'm hopping over to check it out! Debbie, some really good topics, I agree. I know you'll enjoy it!